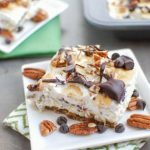 A fun twist on traditional, these Banana Cream Pie Bars are made with homemade vanilla pudding and whipped cream, plus fresh bananas and lots of pecans, peanut butter and chocolate for a delicious dessert. I’d have to say chocolate and peanut butter is my all-time favorite combo but chocolate and banana is a close second. How perfect, then, that my parents are here this weekend and I needed to make a dessert to celebrate my dad’s birthday. One of his favorite desserts is Banana Cream Pie, so I decided to get a bit creative and make a homemade version with my own spin. Inspired by this recipe, I decided to get a bit adventurous and make my own vanilla pudding and my own whipped cream! Instead of a traditional nilla wafer or graham cracker crust, I made a no-bake crust using some Natural Delights Medjool dates that I had in the pantry, along with some pecans and peanut butter. I love using dates as the base for my energy balls and knew I could make a crust similar to the “sandwich” part of my Healthy Ice Cream Sandwiches. Then, to really add my own spin, and because the flavors go so well together, I added some peanut butter and chocolate! In true food blogger fashion, I had to send my dad a picture of the finished product and then cut it up and take my pictures in the good light before he got here. The recipe sounds complicated but really the hardest part is the pudding…and that’s not hard, you just have to plan a little to give it time to cool down and thicken. Don’t worry if it’s lumpy, it doesn’t affect the taste! In a saucepan, combine the half and half and milk and bring to a simmer. In a separate bowl, combine the egg yolks, cornstarch and sugar and stir to combine. It will be lumpy. Add ½ cup of the warm milk to the egg mixture and whisk to combine. Add egg mixture to the milk, whisking constantly. Bring mixture to a boil and whisk constantly for about 5 minutes. Transfer to a container and refrigerate for at least an hour to let thicken. Combine dates, pecans and peanut butter in a food process and process until smooth. Dump into a 9×9 pan and press to flatten and cover the bottom of the pan. Combine the whipping cream, powdered sugar and vanilla in a bowl and beat with a mixer until desired consistency is reached and set aside. Slice 1½ bananas and place a layer of banana slices on top of the crust. Melt 3 Tbsp chocolate chips with 1 Tbsp peanut butter (if desired) and drizzle over pudding layer. Slice remaining bananas and place on top of whipped cream layer. Melt 3 Tbsp chocolate chips and drizzle over the bananas. Top with remaining chocolate chips and chopped pecans. Cut into bars and serve or store in the fridge. Think you can handle it? Be sure to pin the recipe so you can try it soon! YAY I have all the ingredients to make this! I really like the use of the dates in the crust, I became addicted to dates just this year. And banana cream pie is one of my most favorite pies! And I LOVE pie. It’s hard to pick just one favorite. sounds like the perfect combo for you! that looks and sounds ridiculously amazing! Yum! These looks so incredible, I’ve done a similar crust for a pumpkin pie and it was delicious. Gorgeous and delicious looking! These remind me of 7 layer cookies but in a banana ice cream cake type fashion. Very creative, Lindsay! I can’t wait to give them a try! Bananas and chocolate are such a great combo! I would love to try this with coconut cream. Go you for making your own vanilla pudding! Ohmigosh, this looks amazing! <3 I love bananas & chocolate together! :] Pinning for future attempts! :D!! Wow – so glad your dad had his birthday right around this particular ReDux theme – hehe. This look stunning! These pictures are literally making me drool Such a great theme this month. Well, dangerous too. These look amazing! 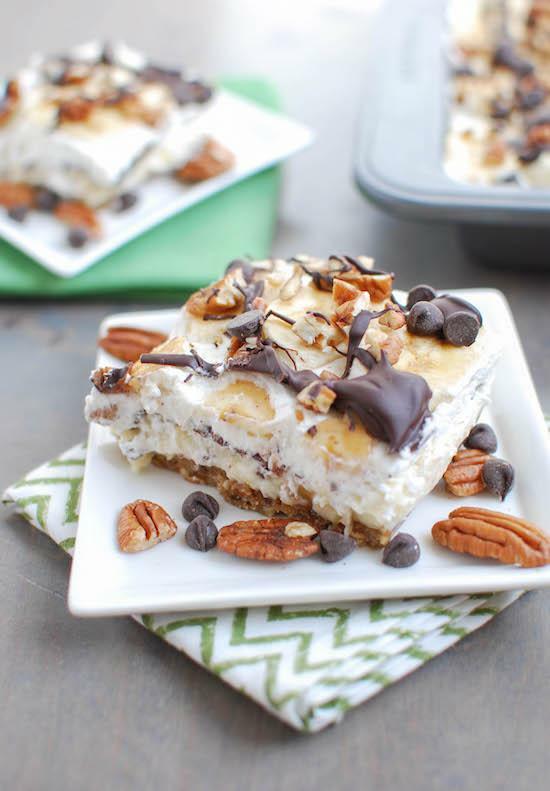 I love the peanut butter/choco combo and to add Pecans….brilliant! Gonna have to try these. This looks so easy! I always thought banana cream pie was a ton of work for some reason. me too! but it was a cinch! Oh no you didn’t! After yesterdays 18 miler, I am drooling… so rungry this morning. Those look so delicious! Sadly, they also look difficult to “veganize” but I can dream! hmmm i bet coconut whipped cream would work…then you’d just have to work on the pudding- maybe a chia seed banana pudding or something? looks yummy! I’ve only ever made pudding using the instant jello packets. Maybe I will have to give this version a try! love the date crust too! I love peanut butter and chocolate together too.. but banana and chocolate is equally as delicious. 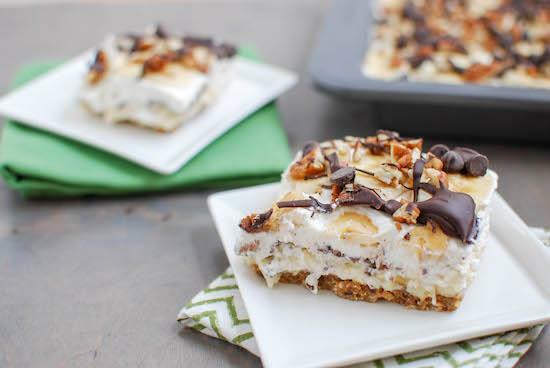 These banana cream pie bars look awesome! Nope. I definitely don’t think I can handle it. But I will try. 😉 Looks and sounds amazing! Wow! This looks insanely good! I am loving the sound of that homemade vanilla pudding – I gotta try it with lactose free half and half – and that crust – gosh darn just sooooo good! the pudding was super easy! definitely worth trying! I love that you can just whip something up like this–so creative! Pinned. Looks absolutely divine, I can’t wait to try them! These look AMAAAAZING. So decadent! 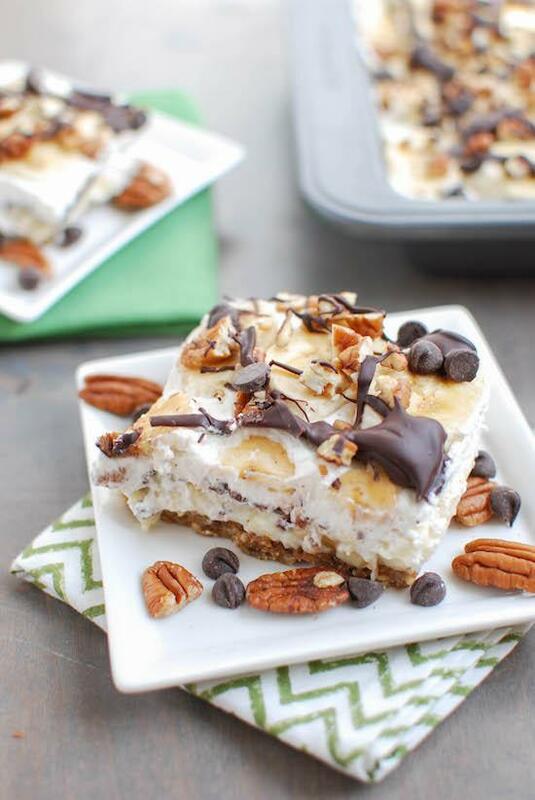 I love banana cream pie and would have never thought to put them in a bar! This looks SO good!! I’ve never made homemade pudding but I think I’ll have to try it just so I can make these. YUM! One of my personal favorites! Love that clever crust. Nicely done, and pinning this for the next time a decadent treat is in order. Thanks Lindsay. Thanks so much Katie! The crust was a big hit! Wow these look and sound super amazing. Pinning! Oh my goodness… this looks DELICIOUS!!! Ahhh banana cream pie is one of my favorites, but I never make it at home because of all the added sugar/cream that’s in it. I REALLY want to make these. Thanks for sharing 🙂 will pin this for near-future cooking. yay! hope they’re a big hit! These look amazing! I love, love, love the addition of chocolate and peanut butter. hi- i don’t allow people to share my full recipes, sorry! you’re more than welcome to share the photo and direct people to my blog for the recipe though. thanks! hmmm no idea. if you added the cornstarch and boiled it for a bit it definitely should have thickened up…but it won’t be firm enough to eat with your hands. i ate mine on a plate with a fork. [WORDPRESS HASHCASH] The comment’s server IP (198.57.247.219) doesn’t match the comment’s URL host IP (192.254.235.175) and so is spam.